Good news for peddlers, pedestrians and people who like public ‘portation from our great and all wonderful leader, Barry O, as we call him in the smoking circles I frequent. $8billion has been allocated to high speed rail development in the USA, thanks to the stimulus plan and my son’s hard-if-yet-be earned money. How much high speed rail does $8billion get you? In today’s world where items are measured in hundreds of millions, it might not seem like a lot, but alas, it’s a giant chunk, just have a peeper’s feast on the imagery below. 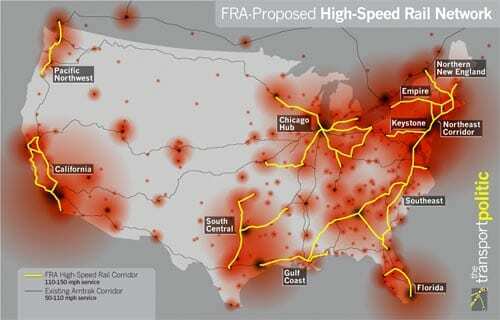 Yellow = new high speed rails, thin gray equals existing Amtrak rails (Amtrak is also getting it’s own $1.3billion). That’s a nice chunk of rail, and makes my ears meet my lips as I grin at the thought of taking a high speed train all the way from Pittsburgh to Texas, even if it’s got it’s share of naysayers. And that’s not the only good news, apparently cities, cyclists and streetwalkers will be benefiting big time from the package as well.